Sales of equipment and services to the U.S. Navy continue to be the major source of business for marine equipment manufacturers. The U.S.
Navy represents an annual sales market totaling $35.0 billion—ex- cluding aircraft procurement, per- sonnel and other non-relevant ex- penditures. Despite recent efforts to cut the growth of overall defense expenditures, the Navy maintains a strong position. There continues to be tremen- dous opportunities for increased product, sales and market expan- sion as a result of the huge amount of business generated by the Navy ongoing purchases. 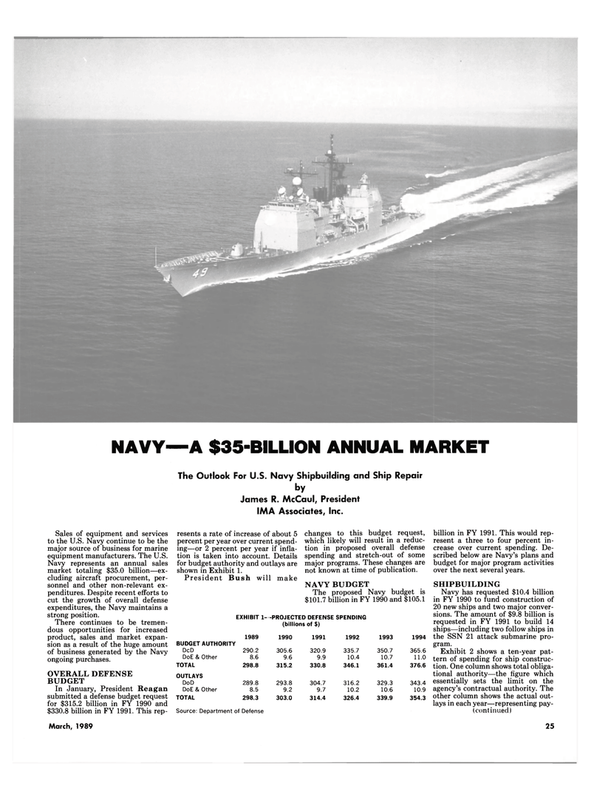 In January, President Reagan submitted a defense budget request for $315.2 billion in FY 1990 and $330.8 billion in FY 1991. This rep- resents a rate of increase of about 5 percent per year over current spend- ing—or 2 percent per year if infla- tion is taken into account. Details for budget authority and outlays are shown in Exhibit 1. EXHIBIT 1- changes to this budget request, which likely will result in a reduc- tion in proposed overall defense spending and stretch-out of some major programs. These changes are not known at time of publication. Source: Department of Defense billion in FY 1991. This would rep- resent a three to four percent in- crease over current spending. De- scribed below are Navy's plans and budget for major program activities over the next several years. Navy has requested $10.4 billion in FY 1990 to fund construction of 20 new ships and two major conver- sions. The amount of $9.8 billion is requested in FY 1991 to build 14 ships—including two follow ships in the SSN 21 attack submarine pro- gram.